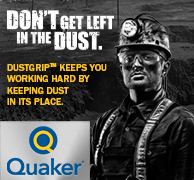 February 4, 2019 - The state of Montana’s coal industry is in flux. Conservationists blame the market’s move away from fossil fuels. Industry leaders blame strict regulations. Either way, the future of coal is up for debate, and a recent committee hearing in Montana’s Legislature proved that. 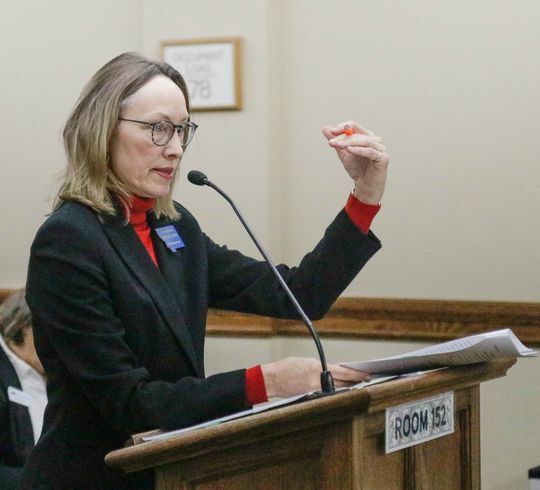 Rep. Mary Ann Dunwell, D-Helena, said in her bill’s initial hearing Jan. 30 that it would be strategic to keep Montana-made money in Montana by taxing carbon. Rep. Mary Ann Dunwell, D-Helena, is carrying House Bill 193, also called the Montana Climate Action Act, which would tack a $10 tax onto each ton of carbon content -- like carbon dioxide emitted from coal-fired plants. During the House Taxation Committee hearing last week, Dunwell argued it’s time to move away from coal energy because it negatively affects public health, the environment and the economy. The bill calls for splitting the projected $210 million yearly revenue from the tax between the state’s general fund and to the “redevelopment” of impacted communities who rely on fossil fuels. “You could also call it a ‘save Colstrip and other communities like it’ bill,” Dunwell said. The statement drew audible scoffs from some audience members. 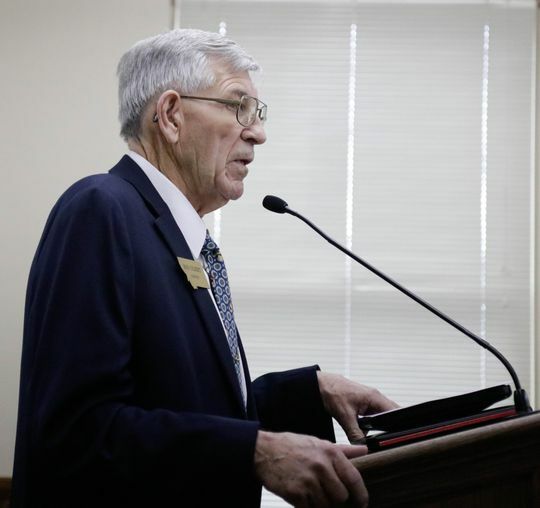 Bob Gilbert is a former, longtime legislator from Sidney, Montana and now works as a lobbyist. Bob Gilbert, a former legislator from Sidney who now works as a lobbyist, testified against the bill, representing the town of Colstrip. He asked how the bill would replace hundreds of lost jobs and why 50 percent of the revenues would go to the general fund and not more to impacted communities. He also disputed the crux of the carbon tax argument. “Don’t give me the garbage that coal is killing people,” Gilbert said. The two-hour hearing drew 11 proponents of the bill, including Anne Hedges of the Montana Environmental Information Center, who implored lawmakers to consider the expensive consequences of climate change disasters. Fourteen groups and individuals opposed the bill at the hearing, including David Hoffman with NorthWestern Energy, who said the cost of the tax would increase Montanans’ utility prices. While coal has often been a contentious topic for lawmakers, the dramatic changes in the national coal industry and the impending closure of units one and two of the coal-fired power plants in Colstrip slated for 2022 have added urgency to the debate. The closures are part of a 2016 settlement in a suit filed by environmental groups claiming the plant was violating the Montana Clean Air Act. On top of that, the state of Washington denied permits to a company seeking to build a port for coal exports on its coast, which would have made shipping coal from Montana to Asia much easier. Colstrip’s state senator, Republican Duane Ankney, describes efforts to help Colstrip as a fight for survival. Ankney said the loss of coal mining would be a huge hit to Montana’s economy. “That is not a hole we could fill easily,” he said. Last year, the Montana Chamber Foundation commissioned the Bureau of Business and Economic Research at the University of Montana, with the help of industry leaders, to make a report predicting the economic impacts of a decline in coal production. The results released in June were bleak. It found the state would lose roughly 3,000 jobs in all and about $80 million in state collection revenues each year between 2028 and 2043. Market Shifts or Strict Regulation? According to the federal Energy Information Administration (EIA), national coal exports declined drastically between 2013 and 2016, during the Obama administration, which introduced new carbon emission regulations and pushed for use of renewable energy sources like wind and solar. In Montana, 2017 was the first year coal accounted for less than 50 percent of the state’s energy generation according to the EIA’s profile of the state. This is what many industry supporters call the “war on coal,” and what Ankney said is the reason for Colstrip’s decline. He said with a change in president, coal exports are increasing again. The same EIA report shows that exports have increased in the past two years. University of Montana law professor Samuel Panarella, however, says it’s more nuanced than that. Panarella practiced energy law and helped companies develop renewable resources before teaching. He said two main factors are contributing to coal’s demise: competitively priced natural gas and cheaper batteries that can store electricity from renewable energy. Panarella said market forces have been more influential than legislation in the energy economy. “I don’t have the view that it’s Obama-era legislation that is causing coal to be in a slump,” Panarella said. Panarella said that, of course, there is still demand and need for coal in the U.S and Asia, but he was unsure about how long demand will last into the future. Debate in Montana’s Legislature last week showed state leaders are grappling with how to move forward in this fast-changing market, and with changes in public opinion of coal. According to the EIA, Montana has the largest coal reserve in the U.S. and 75 percent of mined coal leaves the state. Other states get about 45 percent and the remaining 30 percent is shipped to Canada and Asia. The state’s Attorney General Tim Fox joined his counterparts in Wyoming, Utah, Kansas, Nebraska and South Dakota in filing an amicus brief last May to show support for a lawsuit against the state of Washington for blocking construction of a port for coal exports on its coast. Wyoming’s Legislature is currently considering a bill that would authorize lawmakers to bring their own suit against the state. Montana Rep. Joe Read, R-Ronan, introduced House Resolution 4 last week, which requests the federal government intervene in the dispute. The resolution claims that Washington is violating the interstate commerce clause of the U.S. Constitution, and that the state is discriminating against the project because it involves coal. “We should be defending our constitutional rights,” Read said in the resolution’s hearing. Others, like the Northern Plains Resource Council, argue that Washington has the right to govern the environmental quality of its land and water. When the Washington Department of Ecology denied the permit for the Millennium Bulk Terminals for coal export, it released a statement saying there were too many “unavoidable and negative environmental impacts” to allow for the port. The Colstrip lobbyist, Bob Gilbert, said Washington will not have reliable energy if it decides to reject Montana coal. He said the demand for coal in Asia is high, and that Montana would be better off if it had its own ocean port. “I keep praying every night for the San Andreas fault to open up,” Gilbert said, referring to the fault line that runs along the borders of West Coast states. Ankney said Washington should be careful what it wishes for, citing Puget Sound Energy’s mix of resources that supplies electricity, which is comprised of 30 percent coal. Ankney said coal provides a “base load” of energy, and that Washington won’t be able to keep the lights on without it. Ankney also argued the industry should be given a chance to create updated facilities that generate “clean” coal, an idea conservationists dispute as possible. In any case, Ankney has introduced legislation in preparation for a future with less coal. His Senate Bill 191 would create a county coal mine trust fund to prepare for revenue losses in counties that depend on coal. 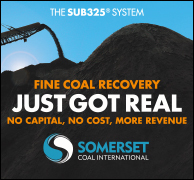 It would take money earned from coal-related activities and put it in trust for county governments to use. The Montana Legislature does have a coal severance tax trust fund in place, but Ankney said it doesn’t go far enough. “There isn’t a damn dime in there for displaced workers,” Ankney said. The bill states the money may be used to attract new industries to impacted areas or to decrease property tax mill levies. Ankney, a former coal miner, said the industry gave him a good life, and independence to raise a family. He wants that opportunity to continue.